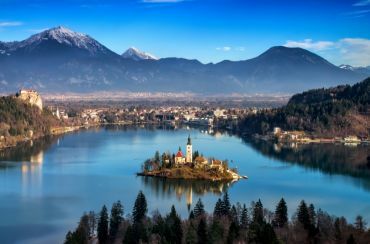 Lake Bled - one of the most amazing places in Slovenia. It has everything that may surprise you - emerald water, clean air, beautiful priroda.No most attracted the attention of a small island in the middle of the lake. 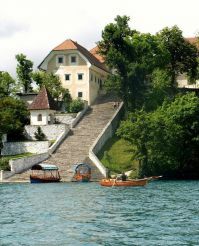 You can get to the island by boat, which is very reminiscent of a Venetian gondola. 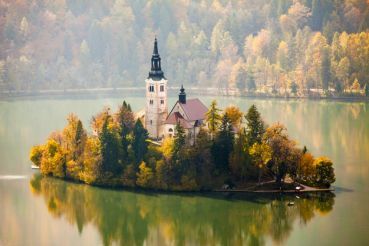 Middle of the island, surrounded by a green, is the church of the Assumption of the Virgin Mary. To the church are 99 steps. Go upstairs and you'll find a wonderful view. By the way, there is a belief that if the groom will rise to these steps with the bride in his arms, then they will live happily ever after.